Michael Westen is a contract agent for the CIA. 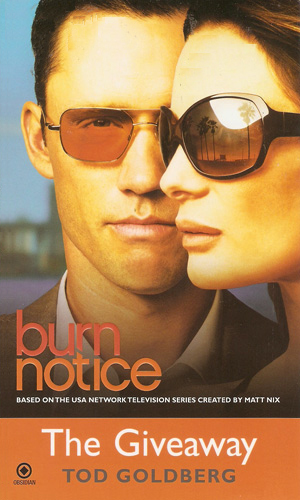 Initially the actual agency name is never mentioned in the books or in the television series, Burn Notice, from which the books were based but as the series progresses, the coyness of mentioning the CIA departs. After many years as a highly respected and very capable career, Westen finds himself suddenly blacklisted by his employer who issued a "burn notice" on him. In the parlance of that agency, this means that he is out of work, bank accounts frozen, without the protection of his colleagues, and stuck in his home town of Miami Beach. As he struggles to learn why he was fired and who was behind his drastic denouement, Westen takes odd jobs around the metropolitan area, often in aid of someone without the ability to protect him or herself. 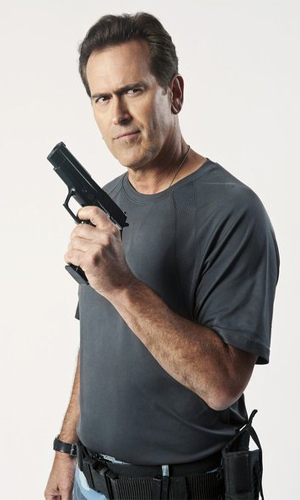 Though used to working alone, Westen has learned to call frequently upon the aid of his old friends; Sam Axe, a retired agent, Fiona, an Irish beauty who has loved Westen for years, and even his mother, a chain-smoking widow who has a wonderful air of naïveté about her which makes considerable wisdom and determination. Through time, we learn much about Westen. We find that he was the older of two sons of a drunken bully who beat the two and their mother with little provocation. His mother, a sturdy, strong-willed woman was determined to stay alive and keep her sons that way as well but when Westen reached adulthood, he left as quickly as he could. One of the first things he did when he started to work for the government as an agent was to learn how to defend himself, determined to never be the target of a bully again. His skills at hand-to-hand combat became almost legendary and he has black belts in at least two disciplines. His knowledge of explosives, both professionally made and improvised is phenomenal and his shooting skills are among the best. Best of all for his longevity is his incredible ability to think on his feet. Knowing no plan ever survives the first encounter with the opposition, he is able to weigh the situation and alter the plan as needed. Without that skill, he and his compatriots would have been dead long ago. The recorded adventures in the pages of the books recount his different activities as he lives in Miami Beach and tries to survive long enough to learn who burned him and why. The adventures in the television episodes go far beyond that as he works to uncover the truth and, when he finally does that, to get his old job back. Socialite Cricket O'Connor was pining for her lost love, a man who claimed to be just back from a hush-hush operation in Afghanistan. She is also missing a considerable fortune he took of hers when he left. Michael Westen is asked to help get it back. Michael Westen goes to the aid of a helmsman on a yacht entered in a high-stakes race whose family is being held captive to make sure that yacht makes it to the final race and then loses. Michael Westen is called upon by friend and sometime helper, Barry the money launderer, for help. Barry has a friend who has stolen from a bike gang who now want him dead. The favor is to keep the friend alive while convincing the gang to ease off. Michael Westen once knew Eduardo Santiago as a street thug but now the man has reformed and is known as Father Santiago and is a community activist. A gang is trying to blackmail him into returning to his old ways and he turns to Weston for help. Brent Grayson is a 19-yr old scam artist who needs Westen's help when his father is kidnapped by Russians demanding Brent hand over his company which sells broadcast bandwidth. Unfortunately, the company is a sham and Weston has his work cut out for him. Shows a brief glimpse of the life that Sam Axe had before he became a close associate of Michael Western. 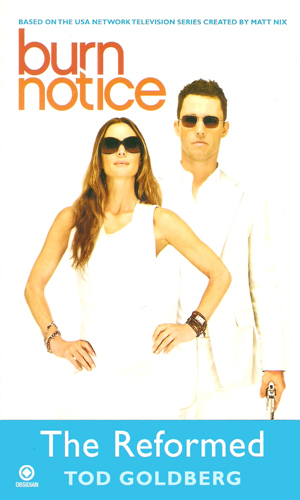 Burn Notice, a series on the USA cable network, was first broadcast in June of 2007 and ran 12 episodes. One year later, it returned in two groups of shows, the first nine from July to September and the remaining seven in January to March. This splitting of shows into two mini-seasons continued for several more years. The character of Michael Westen was played superbly by Jeffrey Donovan who provides the character with a quiet solidness and dependability devoid of cockiness or machismo. He knows what he can do and has no reason to talk about it. Mr. Donovan also has incredible range in slipping into roles ranging from scared nobodies to fierce hard cases, all believable and all entertaining. Also in the cast are terrific talents such as veterans Bruce Campbell as Sam and Sharon Gless as Mrs. Westen. Watching these two go about their business is an honor as they are both so capable and so good. Lastly and most importantly is the fantastic Gabrielle Anwar who portrays Westen's former, and still hoping, girl friend, Fiona Glenanne. The character is a former member of the Irish resistance movement who now makes her living with gun running and other less-than-legal activities. With Ms. Anwar playing her, Fiona can be highly aggressive ("Shall we shoot them?") while never losing her exquisite femininity. I became a fan of Michael Westen from the first episode. I had liked the lead actor, Jeffrey Donovan, in Touching Evil, a crime drama that did not get the appreciation it deserved, and really enjoyed his comedic skills in Bait. Since this was a new spy series, I was already predisposed to like it but I would have anyways because the concept was so terrific: a spy who takes on bad guys. That and the show had a terrific supporting character is Fiona Glenanne, a feisty a woman as anyone could want and no one could handle. She was played by the delectable Gabrielle Anwar so I was hooked. Sharon Gless added gravitas to the series because she does nothing badly. And Bruce Campbell, a legend already, played Sam Axe. What was not to like. Seven seasons the show has been running and I have not missed an episode. Regarding the books, I have not been a big fan of books written about television shows as the books are usually not considered part of the official "canon" and as such cannot take the characters anywhere the TV show hasn't already. But since the concept of the show is that Westen takes cases helping people as he tries to get his old life back, it is possible to view the book plots as just jobs the show didn't cover. They are very fast reads but really only for those who are big fans of the show. Mr. Goldberg does a good job, though. The grade is for the overall concept of a book series that cannot alter the character in any way, not for the job that Mr. Goldberg does. I was attracted to the series when the DVDs came out each season. The main character caught my attention and interest right away. I enjoyed the "Robin Hood" element of a spy helping out people and still managing to get his mission accomplished. Interesting fact: The actor who plays his brother was also up for the main role. Michael's narration in the series helps a lot and makes the shows more enjoyable. A series well worth watching.